Welcome to the Clayton House! Standing regally in the Belle Grove Historic District, the Clayton House serves as a living history book of Fort Smith’s elegant Victorian period during the city’s frontier beginnings on the border of Indian Territory. The Italianate-style mansion also provides a perfect setting for weddings and private gatherings with its stately parlors and expansive grounds. The Clayton House provides a step back to 1882, the year William Henry Harrison Clayton moved his family into the antebellum home that he doubled in size and shaped into an Italianate-style masterpiece. Coal-burning fireplaces and period furnishings in each room place you in a time that featured no indoor plumbing or electricity, but that was rich with austerity. Our guided tour provides a perspective of the mission to bring law and justice to the area from the home of the chief prosecutor of the famous court of Judge Isaac C. Parker. Please browse our website for details on the history of the home and Mr. Clayton and his family, as well as our event rental options. 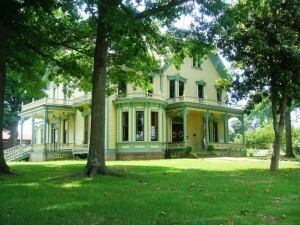 The Clayton House is maintained and operated by the nonprofit Fort Smith Heritage Foundation, which led its restoration after saving the home from demolition in 1969. We thank you for your support of the Clayton House, as well as your participation in our many programs and events. Family History Share, Oct. 25, with David Cravens: "Serving and Guiding: Five Generations of the Cravens Family"
Family History Share, Sept. 27 with State Rep. George McGill: "A Legacy of Love: The McGill Family"
Family History Share, Aug. 23 with Steven Clark: "Fort Smith Pioneers: The John Clark Story"
May 23rd "Civil War Days at the Sutton Mansion: An Earlier Clayton House Chapter"
May 2nd "May Day at the Clayton House"
March 22 Clayton Conversations Family History Share: "The Harry Shipley Family"
February 22 Clayton Conversations Family History Share: "The Thomas B. Pryor Family"
Dec. 7 "Clayton Family Christmas Open House"
Aug. 9 "Sippin' On 6th Street: Judge Clayton's Southern Soiree"
July 12, 2014 "Clayton Camp"
April 12, 2014 Themed Afternoon Tea: "Letterpress Printing by Sarah Martin Ridgley"
March 26, 2014 Clayton Conversations: "Women's Rights in the 1880s"
Feb. 8, 2014 "Victorian Poetry Valentine Tea"
Jan. 26, 2014 "Clayton Conversations"